During the interminable wait for the Against the Shadow cycle to begin, I’ve been replaying the Heirs of Numenor scenarios. 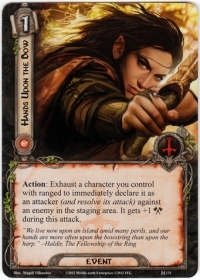 Rather than use the standard hyper-aggressive decks (Dwarves, Beorn, Elrond, etc.) I’ve been looking at different approaches that can also be successful. For me, part of the appeal to deck-building is using overlooked cards to make unique designs. This deck is all about taking some familiar cards, in combination with some rarely used cards, to create a lock on the staging area. 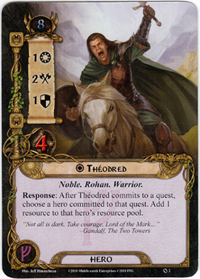 By killing and disabling enemies as they enter the staging area, this seemingly weak deck can successfully navigate challenging quests like Into Ithilien. Everyone is familiar with Háma’s card-recursion abilities, with most decks using Feint to ensure that at least one enemy cannot attack each round. This deck takes a more proactive approach. 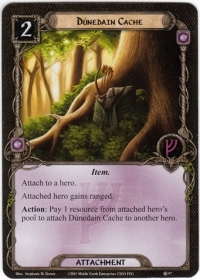 By attaching Dunedain Cache, Háma gains Ranged, which allows him to use Hands Upon the Bow to attack the staging area. With a deck filled with Eagle allies, Support of the Eagles ensures that Háma will kill any enemy (except the mighty Mumak) that enters the staging area. Ranger Spikes and Feint help slow the initial onslaught, and Hails of Stones is another great option for clearing the staging area, once we get an army of cheap allies into play. Háma is not limited to returning Hands Upon The Bow after he attacks, multiple uses of The Eagles Are Coming! is a great way to fill our hand with helpful eagle allies. Feint can also obviously be used in the traditional style if we need to just hold off an attacking enemy until we can kill it. Eagles are particularly effective in Battle and Siege quests as they provide high attack or defense for a low cost. 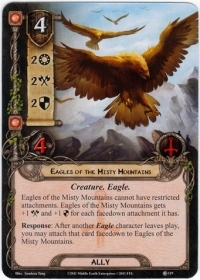 Eagles of the Misty Mountains are the most important ally in this deck as they provide insurance for your low-hit point allies. If you are questing in a Battle with all of your eagles and a Blocking Wargs kills your Vassals of the Windlord, the dead Vassals can become attachments on the Eagles. Not only will this help offset the lost attack for the quest, but it will also increase the defense of the Eagles of the Misty Mountain for subsequent Siege quests. 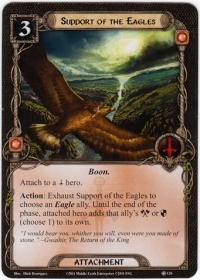 It is relatively easy with this deck to get an Eagles of the Misty Mountains that has 5 attack and defense, which ensures that Háma (with Support of the Eagles) can kill anything that enters the staging area. Using Hands Upon the Bow proactively like this is particularly effective with enemies like the Haradrim Elite that will try to attack immediately when they enter play. Theodred and Bifur are here for support. Not only do they help out with Battle and Siege questing, respectively, but they both have resource smoothing abilities that supplement the extra resources from Steward of Gondor. We want to provide Háma with maximum resources to pay for events and the more expensive allies. 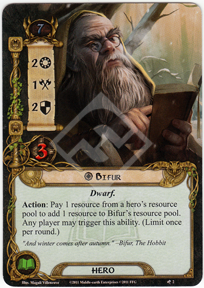 Once Steward and Dunedain Cahce are in play, Theodred should usually always send his resource to Bifur. Lastly, the deck is rounded out with card draw, not only with the aforementioned The Eagles Are Coming!, but Gleowine and Master of the Forge provide it more consistently. Radagast the Brown serves many roles, providing a bit of extra resource generation as well as some healing and a bit of much-needed willpower for the few traditional quest stages. The early game is critical in each of the Heirs of Numenor scenarios, so we have some cheap allies that will serve as chump blockers. The basic strategy of this deck is to stall until we can setup Háma with the necessary attachments to patrol the staging area. Cram allows Háma to take multiple actions, whether killing multiple enemies in the staging area or using the defense boost of Support of the Eagles to block one of the bigger enemies. This entry was posted in Deck Lists, Strategy and tagged Bifur, Deck List, Direct Damage, Dunedain Cache, Eagles, Fantasy Flight Games, Hama, Hands Upon the Bow, Living Card Games, Lord of the Rings LCG, Ranged, Theodred, Tolkien. Bookmark the permalink. I need to try this out. I’m becoming more and more a fan of Hama. Despite his obvious potential, I always seemed to pick other heroes over the doorman, but lately my eyes are opening to how useful he can be to make creative decks beyond just a lock deck. Very cool! I love these creative decks that implement original combinations that the designers likely did not imagine, yet are still fascinating thematically rather than “game-breaking”. I’m going to give this one a try! Nice. One question, won’t Haradrim Elite’s forced effect trigger before hands upon the bow can be used? The immediate attack triggers, but that just means that you perform the normal steps for an enemy attack (with the one wrinkle being that the enemy is attacking from the staging area). If an enemy is killed before its attack resolves, you don’t need to resolve the rest of the attack (e.g. any shadow cards are discarded without resolving shadow effects and no damage is dealt). Because there are player action windows between each step in an enemy attack, you simply use Hands Upon the Bow in the first of these windows (before you would declare a defender). As long as you have enough attack to kill the enemy the attack just fizzles. This is functionally the same as when a Gondorian Spearman kills the attacker after declaring as a defender as the enemy dies before it can finish its attack, it just happens before you have even declared a defender. Really love this deck concept. I have a similar concept using Legolas and Hama with Frodo. Love being able to control the staging area. Keep up the awesome concepts. Great deck, it does have a bit of weakness in Willpower, I got to the 3rd quest phase in Peril, but threated out due to two local troubles and an ill times collateral damage. Gonna give it another shot, was pretty unlucky with that. Thanks Steve, I’m glad that you are enjoying the deck. Yes, willpower is definitely one area where this deck is weak. I have found that Bofur and Eagles of the Misty Mountains are both really important to keep the deck questing successfully. Ideally you can get to a point where you are killing any enemies immediately, and, as long as you don’t get stuck with too many locations in the staging area, you should be able to handle most scenarios. Peril in Pelargir is tough, Collateral Damage can be absolutely brutal. I have lost the game to that card (solo and multiplayer) more than once; any deck without A Test of Will (or Lore Aragorn for threat reset) is going to have problems with that card. Personally, I really hope that the include more different forms of treachery mitigation (not just cancellation) in the upcoming Against the Shadow cycle. I like pretty much all of your decks but this one in particular. 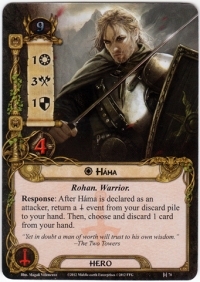 Since I’ve started to play this game only a few weeks ago I’m not very familiar with all of the rules, so I’ve got a question: When you play Hands upon the bow, and declare Hama(Dunedain cache and Support of the Eagles attached to him) as an attacker, you obviously can tap him and attack an enemy in the staging area. If you untap him now with cram for example, can you still tap him again to attack another enemy in the staging area? And will Hama keep his amount of attack for the second attack, if I tapped Support of the Eagles before? Thanks for the kind words, Khamûl. Hands Upon the Bow only allows Hama to make a single attack into the staging area each time you play it. You can trigger Hama’s response, discard some other card and return Hands Upon the Bow to your hand after Hama is declared as an attacker. This would allow you to return Hands Upon the Bow to your hand and play it again later in the phase. With Hama readied (from Cram or some other effect), you could pay for Hands Upon the Bow a second time in order to make a second attack against an enemy in the staging area. As long as you have cards to discard, resources to pay and effects to ready Hama, you can keep attacking with Hama. The attack bonus from Support of the Eagles lasts until the end of the phase, so Hama would get the bonus for any attack that you make during the phase that you exhaust Support of the Eagles. I hope this answers your questions.